IOGKF International semimar for instructors, in Chişinău, from 9 to 12 February 2012. In Chisinau, from 9 to 12 February 2012, has been organized an International seminar for instructors under the leadership of Victor Panasiuc, chief instructor of the Republic of Moldova, 6 dan. International karate seminar in Moldova. In karate, medals and diplomas have no importance. This kind of martial arts, the fighting itself is not intended to victory, is quite popular in Moldova, where annual international seminars are organized. This year's seminar, attended by over 20 instructors from neighboring countries, is led by the moldavian Victor Panasiuc. Not all martial arts styles aimed at victory. The best example is the fight traditional Goju-Ryu karate. The purpose of practicing this style of fighting is not medals, but harmony in life, cultivated the art of fighting, but not by the number of victories. "One is sport. Hoards medals, diplomas, and then sit on the oven and count them. In traditional battles, a good example is Higaonna: has over 70 years and has strong hands," says Sergei Corobov, Goju-ryu karate instructor, Russia. "The aim of any competition is to be the first. Thoughts about themselves can not bring harmony," says Victor Panasiuc President of Goju-Ryu Karate Association of Moldova. 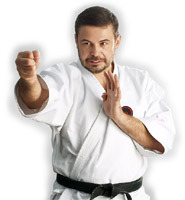 This kind of karate is quite popular in Moldova, because of mentor Victor Panasiuc, six dan black belt holder. Thanks to, Chisinau attract more professionals from neighboring countries. "These seminars are held every year. For us it is a good opportunity to get up the level", states Denis Vasilciuc, Goju-ryu karate instructor, Ukraine. This year's seminar, which runs from February 8 to 12, was attended by 25 instructors of Goju-Ryu karate from Moldova, Ukraine and Russia.